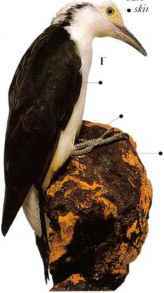 I his bird's name refers to its neck-stretching and head-twisting movements, used to threaten an enemy. It feeds on ants, extending its sticky tongue into their burrows to extract them. • NEST A hole in a tree, wall, or bank. DISTRIBUTION Eurasia and n.vv. Africa. Winters in Africa, India, and s.E. Asia. I iny and active, this woodpecker sometimes looks more like a small passerine when seen feeding and foraging. It lives in undergrowth in forests, clambering and hopping among branches, leaves, and twigs, and searching the ground litter, taking ants and other small insects. 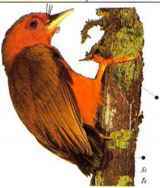 When feeding in bamboo and small trees, it taps the surface and probes the bark in more usual woodpecker fashion. • NEST a hole excavated in a branch. • DISTRIBUTION S.E. Asia in Malay distribution Peninsula, Sumatra, Java, and Borneo. 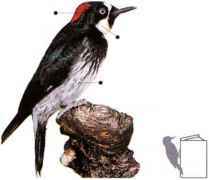 I his sociable woodpecker has a close association with oak trees. 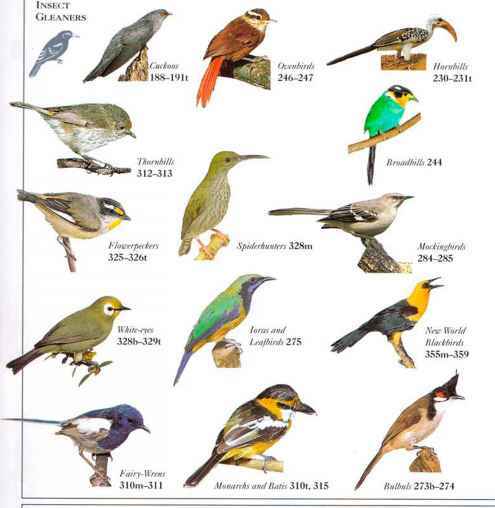 It lives in groups of up to 12 birds that defend a shared territory and nest communally. In late summer, the birds bore rows of holes into trees, fences, and wooden buildings, fixing an acorn in each hole to be stored as a future food supply for the group. Insects are also eaten in the summer, and some other nuts and fruits in winter. The call is a raucous double note. DISTRIBUTION W. North America to Colombia.